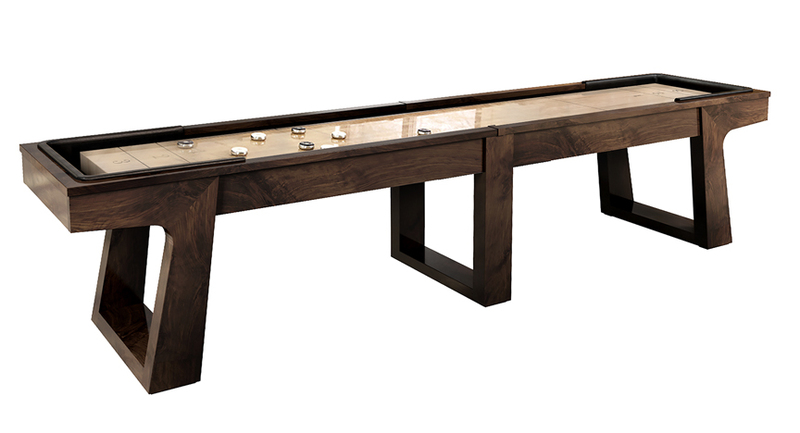 What Makes a California House Shuffleboard Table Different? Shuffleboard tables built by California House have several distinct features ranging from craftsmanship to aesthetic. The Loft is built with a traditional feel that’s sturdy and inviting. This model would go perfect in a barn-house or would absolutely set off the interior of a home with an old-fashioned glow. See more of this table here. Wood selection: They use beech to construct their playfields, whereas most companies use maple. Why? Beech is a far tougher wood, unyielding and shock resistant to guarantee a long life. Polymer seal: The manufacturers took the advice of a chemist who recommended they reduce their polymer thickness from 1/4” to 1/8”. The fine polymer resin is applied on all sides of the board to balance-seal it. This produces a solid playing surface that won’t warp over time and a coating that won’t yellow. More on shuffleboard table finishes here. Playfield thickness: Instead of the typical 3” thickness, the rigidity of beech allows the company to make their playfields only 2.125”. This improves the playability of the surface by making it easier to adjust. More on shuffleboard table thickness here. Climate adjusters: These are an essential component of any long-lasting shuffleboard, which is why these manufacturers went to the trouble of custom-designing the ones for their game tables. These specialized climate adjusters allow the owner to keep their playfield at the right level of concavity no matter the time of year. Learn how to adjust climatic adjusters. Padded end collars: This is a feature you won’t see from many other shuffleboard brands, though it adds a lot to the game table. The padded collar looks nice, provides a comfortable grip, and protects the table from damage that might be caused by flying pucks. Inlaid details: California House doesn’t paint on their scoring lines and logos. Instead, they are inlaid with black walnut before the polymer resin is poured. This fine detail is just one of the many ways that this brand is creating superior shuffleboard tables. California House shuffleboard tables are inlaid by hand craftsmen to create this unique finish. 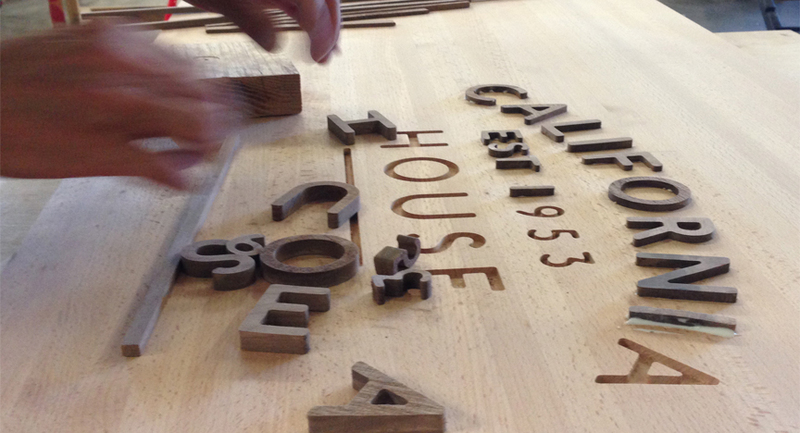 You can see just how far California House goes into making each and every one of it’s tables a lasting masterpiece. And here is the finished product with the polymer finish layered on top, sealing the inlaid logo. If you look closely, you can see how this gives it added three-dimensional look to the table. The scoring lines on California House tables are also inlaid to capture a rich finish that’s unlike any other. Pictured here is the Hillsborough table. All California House shuffleboards are made to order. This allows you to customize a number of of features to create the perfect shuffleboard table for your space, whether you want a 9’ model or an 18’ one. The Bainbridge shuffleboard table picture in a rich American walnut finish. Click to learn more. Finish: Choose from wood finishes like traditional cherry maple, espresso maple, and American walnut distressed. 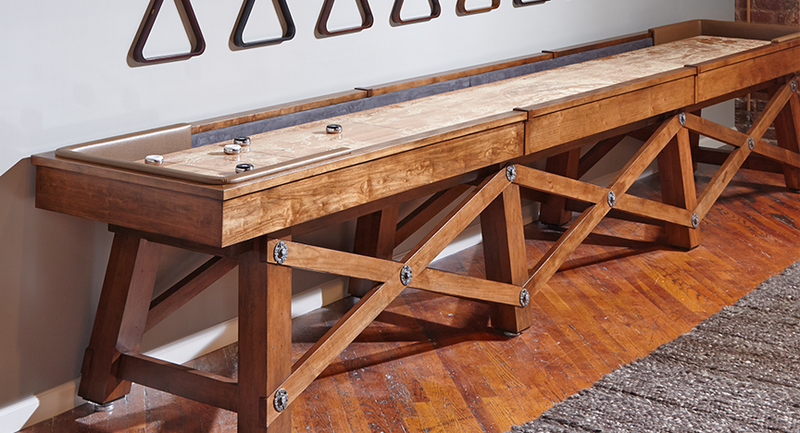 This allows you to easily match your shuffleboard to the existing décor in your game room. Logos: Have a family crest or a shuffleboard team logo? Add a custom logo to your table, inlaid in black walnut just like the scoring lines. Alley fabric: This easy-to-clean polyester microfiber lining fabric comes in nearly a dozen different colors. You can even choose a different hue for the sides and floor of the alley. Collar fabric: Have those convenient padded end collars upholstered in a range of fabric colors ranging from Avanti white to leather. 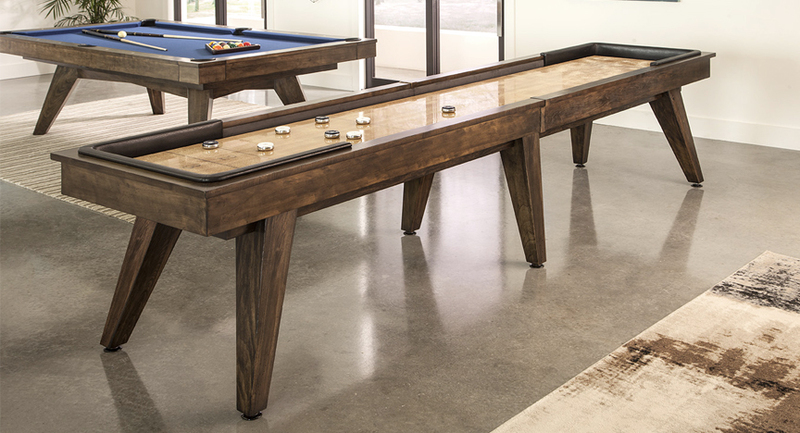 The Austin Shuffleboard Table take a cue from the 70’s furniture design era, showing off the tall, tapered legs of its era that were popularized on entertainment centers, nightstands, and bed sets. Convinced that California House makes the finest artisan shuffleboards available? Then you’re already in the right place to buy one for yourself. Shuffleboard.net is a certified retailer of California House shuffleboard tables. Enjoy choosing between the full range of customizable details for your table when you order through our site. With free shipping and the guaranteed lowest prices on the web, there’s no better site to order your California House shuffleboard. Not sure which table is right for you? Start by browsing the best-selling models: the Hillsborough, the Newport, the City, and the Loft. 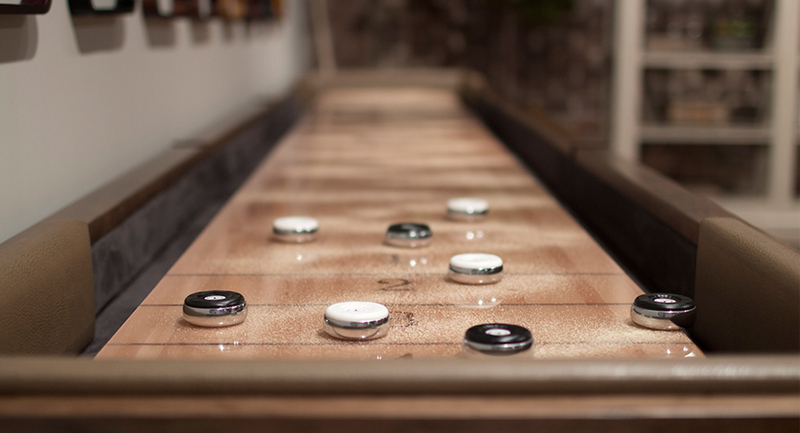 Check out the latest shuffleboard tables and accessories to hit the market. What Size Shuffleboard Table Should I Get?